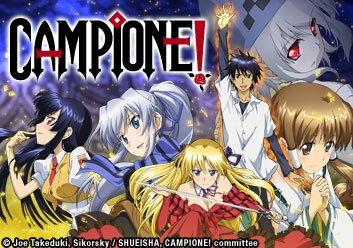 Hey everyone, Eric here and I’m bringing you a new anime: Campione! Now, I would have had this anime posted earlier, but I completely forgot about it until I looked through my Anime List. Anyways, the term “Campione” is Italian and is translated as “Champion” or “God Slayer.” Now just sit back, relax, and enjoy the short summary followed by my review. Some people may find religion, but for 16-year-old Godōu Kusanagi, it’s religion that found him. On a trip to Sardinia to return a stone tablet to Lucretia Zola, a friend of his grandfather, Godōu encounters Erica Blandelli, a member of the “Copper Black Cross” – one of the European magic organizations that inherited secret rites from the Knights Templar and is based in Milan, Italy. Upon meeting Erica, Godōu gets drawn into a battle between rogue gods. These heretic gods (gods who have come to exist in the real world rather than staying as a myth) have the same powers as they do in their myths. The first of few gods Godōu encounters is Verethrgna, the Persian God of War and Victory who loves battling and will do anything to fight a worthy opponent. Using the power of the stone tablet and the help of Erica, Godōu is able to defeat the Persian god and take all his powers and abilities, earning him the title of Campione, “God Slayer.” Being joyful about his defeat, Verethrgna blesses Godōu before passing on, as well as a stern command, telling Godōu to not fall to anyone else before their rematch when Verethrgna revives. Upon becoming a Campione, it is now Godōu’s duty to fight and kill other Heretical Gods whenever and wherever they appear and start changing to suit themselves, usually at the expense of the people in the area. A side problem for Godōu, due to his newly “enhanced status” is that he inadvertently attracts the the attention of many difficult girls, one of whom is Erica Blandelli, who strongly and forwardly expresses her love for him. Now, I try to keep the summary shorter than usual for a few reasons. The anime is only 13 episodes long and I don’t want to spoil anymore than I already have. So, I want to ask all our viewers a simple question. What would you do if you were locked mortal combat with a God, and won, and earned the title Campione? Keep in mind that killing a God, you earn their powers and abilities, and gain immortality, sorta.. However, Heretic Gods don’t stay dead forever, for as long the myth about them is still known among humans, they will resurrect. My rating for this anime is 9.7 out of 10. I say 9.7 because the only thing that got me down is that it’s only 13 episodes long. The plot of the story is amazing, the main character’s “lovers” were enjoyable and extremely humorous in turning Godōu’s world around, and the many different Gods from all types of mythology were fascinating. I recommend this anime to anyone and everyone. Thanks again for coming to our site. I will speak to everyone during my next anime review. If you wish to know more or have any questions, please visit http://ask.fm/TheHistoricalNerds. Thnx for the review. I’d been skeptical about watching this one. I just hope it’s not one of those typical harem shows with nothing but fan service and cheesy plots that don’t even make sense. Thnx to your review I’m going to give it a shot. Too bad there aren’t any serious anime coming around lately. actually, if u want something serious, i would recommend Occult Academy, Sword Art Online, Pandora Hearts or BTOOOM!